When you try to send multiple Photos on iPhone, the Messages App inserts an iCloud link to Photos, instead of attaching actual photos in your Message. 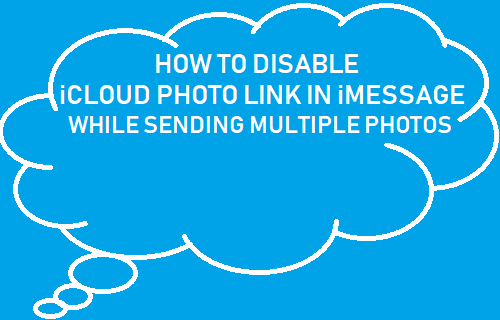 You will find below the steps to disable iCloud Photo Link in iMessages while sending multiple Photos. 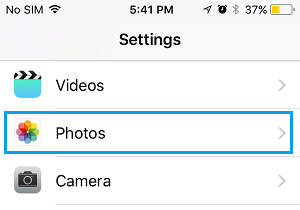 The default behavior on iPhone while sending multiple Photos (four or more) using the Messages App is to send a link to the Photos, instead of attaching actual Photos. This provides an option for the person receiving your message to click on the link and download photos using both Cellular and WiFi Network. While this feature helps in saving Cellular data, it is not liked by those who like to save Messages and all its associated Photos and Attachments together. Another disadvantage of this feature is that the iCloud link to Photos only works for a limited period of time and expires after 30 days. This means that your recipients won’t be able to access the Photos, if they wanted to go back to your message and tried to open the link after 30 days. 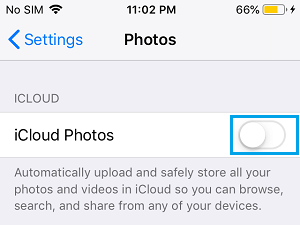 The iCloud Photo Link in Messages App appears by default only when you have “iCloud Photo Sharing” option enabled on your iPhone. Hence, the easiest way to disable iCloud Photo Link in Messages App on iPhone is to disable iCloud Photos. 2. On the Photos Screen, disable iCloud Photos option by moving the toggle to OFF position. This method is not for you, in case you do want to store Photos on iCloud and do not want to turn OFF iCloud Photos. Luckily, it is still possible to send actual Photos via iMessages (even while using iCloud Photos) by using a workaround to Bypass iCloud Photo Link as provided below. While there is no way to prevent iPhone from generating an iCloud link when the option for iCloud Photos is enabled, it is possible to bypass the iCloud Photo Link in iMessages while sending Photos. 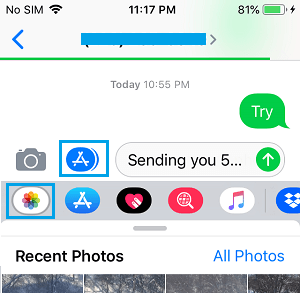 This can be done by opening the Messages App first, instead of opening the Photos App and trying to send Photos using the Share Function in Messages App. 1. Open the Messages App on your iPhone. 2. Open a New Message or tap on an existing Message thread of the Person that you want to send Photos to. 4. Next, tap on the Photos icon located in the bottom App bar. In case you do not see the bottom App bar, tap on the App Store icon. 5. Depending on your case, tap on “Recent Photos” or “All Photos” and select the Photos that you want to share by tapping on them. As you select photos, you will see individual photos being attached to the Message body, instead of iCloud Photo link. 6. Once all the Photos are attached to the Message, tap on the Send button and all the actual selected Photos will be send to your Recipient.